Some parents feel that their child(ren) stay at the table forever! Parents say they are following the Division of Responsibility™ and worry that setting a time limit will be restricting or somehow interfering with their child doing his jobs with eating. There are variations on this theme: When parents say, “that’s it for now,” their dawdling toddler or preschooler takes a renewed interest in eating. School-age kids linger an hour at dinner and want to talk. Eight-year-olds take an hour to eat and squirm a lot. Do you have an agenda for your child’s eating? That is, do you keep him at meals until s/he finishes a certain food or a certain amount of food? Is this the only time s/he is getting your undivided, one-on-one attention during the day? Are there too many “fun” distractions at the mealtime (e.g., toys, TV, phones)? Are you routinely skipping the bedtime snack? – Stow your agenda for what and how much your child will eat. Her slow eating may be her way of putting off eating food she doesn’t want. – Provide a bedtime snack, even if it is just an hour after dinner. As Ellyn says, serve something “filling but not thrilling” (peanut butter crackers and milk, string cheese and fruit). If the slow eating changes, your child was concerned about having to go hungry through the night. – Build in one-on-one time for a couple of weeks. If the slow eating changes, the problem was that your child was using eating for attention seeking. – With older kids, as much as you can, relax and enjoy their sociability. But an hour is really enough! – Verbally set a time limit “We have 30 minutes–45 minutes–an hour–for dinner.” Reassure children that snack time is coming soon. .
– Give everyone a 5 minute heads-up for the end of meal, then as a family put food away and tidy up. Remind children that it won’t be long before snack time. 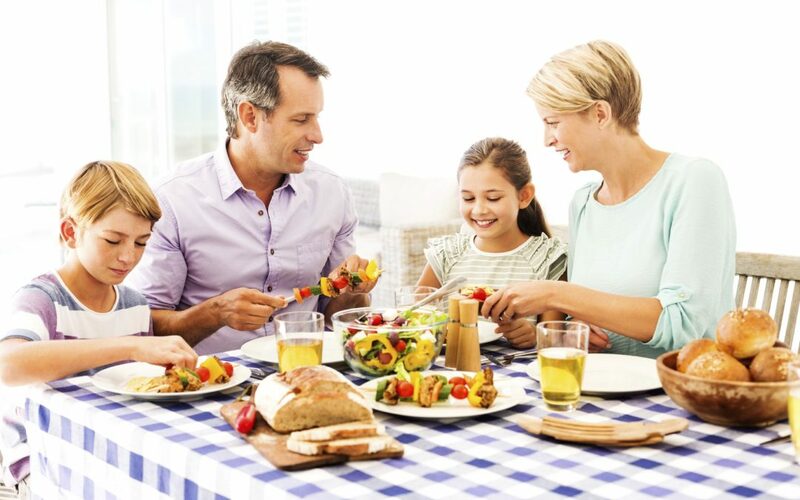 I would agree that if your child is eating and not playing with their food or in any other disrupting your meal, then it is fine for them to stay at the table with you. Hmmmm… interesting! My 2 year old son stays at the table for ages and barely eats sometimes but we get lots of one on one connection time throughout the day, we don’t do distractions, etc. The only thing from your post that we don’t do is bed time snack… I was worried that this would be supplementing and he wouldn’t eat dinner knowing that was coming up. For some children, it is quite a while between dinner and bedtime, so a bedtime snack is appropriate, just like the other planned, sit-down snacks during the day. If you child is eating dinner and going to bed within a short time, then there is probably no need. Hi, I’ve been wondering if it’s OK to set a time limit or not. If we are eating a favorite meal of my sons, like pasta or pizza, he will continuously ask for more (by using the “more” sign— he’s 18 months). This can go on for… forever?? But if it’s a non-preferred meal like baked chicken, he wants out of his high chair after a few bites. (And I allow that). With pizza or pasta, he can literally eat two adult portions and the only way I’ve gotten him to stop is by ending the meal after 30 minutes. Is that OK? It is striking how much more food he eats when it’s food he loves! I suggest you send your question to our Facebook page https://www.facebook.com/ellynsatterassociates/. You will be answered by one of our faculty. Use the Send Message tab. What do you suggest when the child eats minimally at dinner and wants to eat a large quantity, over a long time at bedtime snack? He doesn’t get a snack close to dinnertime, as a rule. My 7 year old soon to be 8 year old takes a long time to eat. He says his stomach hurts when he eats to fast. His stepdad calls him out every meal and compares him to himself and his siblings. He tells my son he will never grow if he “plays games” eating. His stepdad accuses him of holding food in his cheek and not chewing hard enough. He accuses him during meal time of purposefully trying to trick people into letting him stop eating. We don’t offer a choice of meals and stay on an okay schedule. His stepdad says food is fuel not a time to talk. I don’t know what I can do to help the situation. My son is miserable. All children are different and a parent should do what they feel necessary for the well being of their child. I time my child, no shame here, he plays around way too much if I don’t, the rest goes into the trash if he doesn’t finish… If you’re wondering if it works, of course it does. I also give incentives for dinner, if he finishes it all within the time limit, he gets a treat. At one point, my child pretended he was cold during dinners and only ate a couple of bites, I fed him and made it incredibly not fun, he never wants me to feed him again and is never cold now unless it is actually cold. My 5 year old messes around horribly at meal time. It has honestly taken all of the joy out of meal time and is causing problems in our household at this point. We are a very new family as I just adopted my 5 & 8 year old nieces. My boyfriend and I are at our wit’s ends. She plays and talks, waving her hands in the air, touching my plate, tries to lay down on the table, etc. If you give her bread (her favorite) she will eat it slower than what you would think would be humanely possible and then refuse to eat anything else. So now she doesn’t get bread until she has eaten her other food. We have a time limit now or try to, my boyfriend is not a fan and worries she is going to be hungry. I hand fed her last night in hopes of getting her to want to be the big girl, not the baby. Nope, she loved it, although not so much when she realized that I was in control of the caramel on her apple slices. Any suggestions would be amazing. I don’t know what to do at this point.